The Endeavour astronauts worked through a light day in orbit Wednesday, preparing for a spacewalk overnight Thursday, the first of three to attach and outfit a new habitation module, and looking forward to a bit of off-duty time. Space station commander-turned-plumber Jeffrey Williams, meanwhile, spent his "morning" repairing the lab's urine recycling equipment, installing a new distillation assembly centrifuge and pump module brought up aboard Endeavour, along with a new filter that engineers hope will restore the critical system to normal, or near-normal operation. If all goes well, Williams will complete the repairs this evening and the equipment will begin processing stored urine to make sure the system works as expected. "The top priority really will be replacing the distillation assembly, which is a centrifuge that's a central component in the urine processor," said lead Flight Director Kwatsi Alibaruho. "That assembly will be replaced and if everything goes well, we'll do the initial activation of that assembly and start a brief shakedown period." Engineers on the ground "will be looking at the performance of that system, making sure all the currents and the rotation rates and other parameters are as they expect," he said. "And then we'll try to process some of the urine that's been stored. We'll probably start that process early on flight day five (overnight Thursday) or a little bit later." The primary goal of Endeavour's mission is to attach a new habitation module to the station that will house the U.S. toilet, oxygen generation system, carbon dioxide scrubber and water processing system, all of which are currently housed elsewhere in the lab. But the equipment racks will not be moved until the urine processing system has had a chance to operate, generating pure water that will be returned to Earth aboard Endeavour for analysis. Shuttle engineers at the Johnson Space Center are continuing their assessment of Endeavour's heat shield to make sure the orbiter can safely descend to Earth a the end of the mission. LeRoy Cain, chairman of NASA's Mission Management Team, said engineers now have enough imagery to rule out any need for an additional, focused inspection. Time set aside for such an inspection now will be put to use transferring equipment and supplies and doing other tasks. Overall, Cain said, the shuttle's thermal protection system appears to be "very clean" with only two "areas of interest" under discussion. 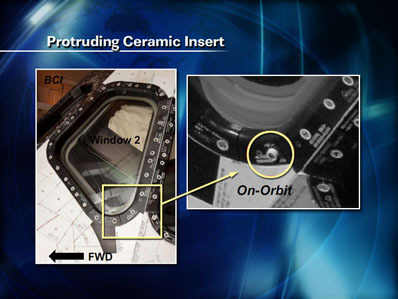 A photo survey carried out by the station crew during the shuttle's approach Tuesday showed a ceramic insert around a fastener securing a carrier plate around one of the shuttle's cockpit windows had loosened, protruding a bit above the surface of the window frame. The fastener acts as a spacer of sorts and engineers are assessing what might happen if it worked loose during re-entry, whether it could strike the shuttle's tail fin, speed brake or an aft orbital maneuvering system rocket pod. "The vertical stabilizer, where we have the rudder and the speedbrake, is the area that would be of concern, possibly the OMS pod," Cain said. "The ceramic insert is a fairly dense material. We'll see what the debris transport shows us." It's not yet known what sort of energy the insert could impart if it did work itself loose, or even whether that's a possibility given that it didn't come all the way out during the vibrations of launch. "There are a whole lot of questions that have to be answered before we would ever consider whether or not we need to do anything to mitigate it," Cain said. "We have more questions than answers at this point, so we'll let the team go off and do the work." Another area of interest is a repaired tile on the upper surface of the crew module. The repair appears to have failed and one corner of the tile has separated slightly from the rest. Neither issue appears to be a serious threat and as of this writing, it appears unlikely any repairs would be attempted. But Cain said nothing has been ruled out. "Those are two areas we'll take a closer look at from an analysis standpoint, we'll do some debris transport assessment and we'll talk some more about those two areas as we go through the mission," he said. "Initially, it doesn't look like we're going to be very concerned about them, but we want to be very vigilant and take a closer look." Overall, he said, "the vehicle is very, very clean from a thermal protection standpoint. Endeavour looks really good." Fixing the urine processor is critical to long-term station operation. With a crew of up to six full-time astronauts, generating fresh water is an on-going issue that will take on added significance when the shuttle is retired later this year. The station's urine processor has been shut down in recent weeks because of problems with the distillation assembly. More recently, blockage in a line knocked out the part of the system that converts condensate into clean water. "We brought home the other failed distillation assembly on the last shuttle flight," station Program Manager Mike Suffredini said before launch. "Through a failure investigation, we found calcium deposits inside the distillation assembly and we're doing quite a bit of investigation to determine how to prevent that in the future. "One way is to not process to as high a concentration of brine inside the system, meaning we empty the tank that carries the ultimate waste from the urine processor, we empty it a little more often. So we want to run the processor with the new distillation assembly inside long enough to fill the tank up to the new level we plan to operate at, remove that tank and bring it home. "That will take us almost the entire mission, from the time we're able to install the spare until the time the crew has to depart," Suffredini said. "That's what's driving us not to do the rest of the rack moves until the urine processor can move." As for the presumed line blockage problem with the water processing system that is preventing conversion of condensate, engineers believe a filter carried up aboard Endeavour should resolve the issue. "When the shuttle arrives we'll install the filter and then we'll activate the water processor along with the urine processor and recover our regenerative (environmental control and life support) system by the end of the mission," Suffredini said. The station has plenty of stockpiled water for extended operations while work to fix the current problems is carried out. Station Flight Director Bob Dempsey described the repairs as "an extensive amount of work." "Once they complete that work, we'll activate from the ground and begin processing the urine and we'll watch that very closely," he said. "We'll process as much as we can through the mission so the filter/tank assembly gets to be used as much as we can and verify that the system is working in its new configuration and then we'll bring it back on the last day." As it now stands, the oxygen generation system, the U.S. toilet and the water processing system racks bound for Tranquility will not be moved into the new module during the normal shuttle timeline. If the flight is extended one day as managers hope, the Endeavour astronauts should be able to get some, if not all, of the equipment transferred.